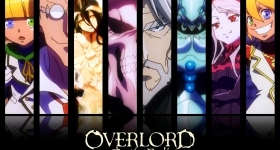 The source material for the popular TV series Overlord just had its 11th volume released and with it an announcement for a movie. Not much about the movie is known at this point, other than that it is to retell the events of the series, which was released in 2015. Aside from the movie announcement, the 11th volume also contains a Blu-ray disc with 30 minutes of new Ple Ple Pleiades footage. The original light novel was first published online in 2010 and later—in 2012—released as printed material by Kadokawa. Description via ANNIn the year 2138 virtual reality gaming is booming. Yggdrasil, a popular online game is quietly shut down one day. However, one player named Momonga decides to not log out. Momonga is then transformed into the image of a skeleton as “the most powerful wizard.” The world continues to change, with non-player characters (“NPCs”) beginning to feel emotion. Having no parents, friends, or place in society, this ordinary young man Momonga then strives to take over the new world the game has become.